During the processing and matching of invoices, trading companies and purchase order-driven organizations that regularly place orders are often confronted with unexpected price discrepancies or additional costs. This results in a time-consuming matching process with the necessity to write off the unexpected costs and to enter a debit in the organization’s inventory. This means that, when the deliveries are entered, the figures do not match the invoice that will later be processed. This risk can be minimized by having suppliers send an order confirmation to confirm your purchase orders. The order confirmation is checked against the purchase order in the accounting records in terms of amounts, prices and delivery date. The processing of the order confirmation and the manual amendment of the order already placed is, however, a time-consuming process requiring a great deal of attention from your administrative staff. The order confirmation received is (physically) stored for verification of the supplier’s invoice to be received later on. Retrieving the right document can take up valuable time. By having your purchase order confirmations matched automatically by ImageCapture, you will save valuable time and avoid the errors that can occur when documents are checked and archived manually. ImageCapture automatically inputs the order confirmations received, from mailboxes set up for this purpose. In doing so, the software automatically links the documents to the right creditor and purchase order, compares the order information confirmed, at the header and line level, with the purchase order in your accounting administration, and immediately flags up any discrepancies. Following approval, confirmed prices can immediately be amended and confirmed delivery dates can be added to the pending purchase order. In case of unacceptable discrepancies, the confirmation can be included in a workflow process, for example to be checked with the supplier. The purchase order confirmation is linked to the purchase order as an annex document and can therefore be retrieved directly when the invoice is processed. When the goods are delivered, these are immediately entered as a debit at the correct value: the value that can be expected on the invoice. With this, the automated processing and matching of the corresponding invoice runs far more efficiently. On our links page you will find an overview of all our available integrations. What if your application is not on the list? Scan Sys is continuously developing new standard links to ERP and financial applications. Please contact us for more information, free from obligation. 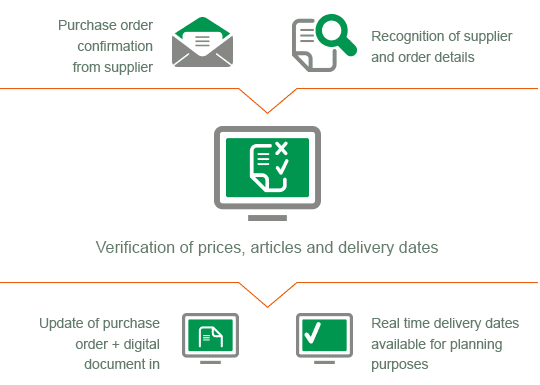 Far faster processing and matching of purchase order confirmations with immediate identification of discrepancies in articles, prices and accompanying information.